Debbie Hales presents dry suits and lifejackets to BLACKPOOL RNLI crewman Peter Barnes (left) and Shaun Wright watched by colleagues and her sons Michael and Matthew. Standing on Blackpool’s North Pier, where a bouquet of flowers have been freshly laid, Debbie Hales gazes out to sea and tries to remember the day her life changed forever. Accounts from emergency workers, subsequent medical records, and her children’s memories help fill in the blanks. But try as she might, the 60-year-old can’t recall climbing aboard a high-power jet ski alongside her husband Ian. And the security industry worker said it feels like she’s talking about somebody else when she retells the moment the family’s 56mph Yamaha Waverunner – bought just two months earlier – smashed into a stanchion just yards away from where she stands over a decade later. What Debbie is sure of, as she marks the 14th anniversary of the Good Friday accident which took Ian’s life and left her with life changing injuries, is how lucky she was to survive. She said: “It’s like an out-of-body experience. It’s bizarre. “The only thing I can remember is I had bought these surfing shorts, and I got up in the morning and asked Ian if I could have his red ones, and he could have my blue ones. “I don’t remember making sandwiches, or getting the equipment together, or anything. What is known about April 18, 2003, is that Ian, his childhood sweetheart Debbie, and three of their five children drove from Breightmet in Bolton for what should have been a fun trip to the seaside. Launching from Starr Gate, the younger members of the family rode the machine in the morning, while Ian, 47, and Debbie took it out in the afternoon. Ian was seen in ‘panic’ by visitors to the pier as the jet ski approached, and experts would later say it’s possible he may have had a heart attack moments before the crash, which left holidaymakers looking on in horror. RNLI volunteers and the Coastguard were scrambled, and Ian and Debbie were pulled from the water and rushed to Blackpool Victoria Hospital, as their worried children were told of the accident after heading towards the scene. Ian, an operations manager at engineering firm Groundforce, was pronounced dead on arrival, while Debbie was left in such a life-threatening condition, her loved ones were taken into a room by doctors and warned she may have serious brain damage. “I was very lucky to survive,” Debbie said. “Not only did I not drown but I should have got pneumonia too. The week of Ian’s funeral, I wanted to see him every day but I was so poorly I could only go once. Debbie was in intensive care for a week before being transferred closer to home. Her health since that fateful day hasn’t been the best. She has developed diabetes, had four stents put in following a heart attack in 2011 and was diagnosed with cancer. But her outlook on life has changed for the better, she said. “I just try and live positively and live each day as it comes,” she added. “There’s no point worrying about what you can’t change. The couple’s children – Michael, Jason, Martin, Joanne, and Matthew – have now flown the nest, but remain protective of their mum and keep their dad alive by talking about him regularly. His death hit them all hard, but especially Matthew, now 31, who Ian was teaching to drive at the time of his death, and Joanne, 32, the pair’s only daughter. Despite agreeing to sell up twice, Debbie still lives in the same home she shared with Ian, unable to sever an important link to her past, and has thrown herself into her work. She has trained in massage therapy and has raised thousands of pounds for the RNLI in Blackpool, and talks highly of those there that saved her life. She also routinely meets with the A&E sister who helped care for her. She added: “I cannot thank everyone enough for the love, care and support shown to my family and I on the day of the accident and in the weeks, months and years since it happened. “The RNLI relies totally on donations from each and every one of us. “I didn’t know at the time it is manned by volunteers – I want to raise that awareness. Colin Lowe, RNLI volunteer lifeboat helmsman said: “Debbie’s rescue is one that has stayed with me over the years and it’s great that she keeps in touch with us so regularly. “Catching up with Debbie and survivors like her really does make it all worthwhile. “Debbie now dedicates a huge amount of time, effort and generosity to fundraising on our behalf and that’s extraordinary. 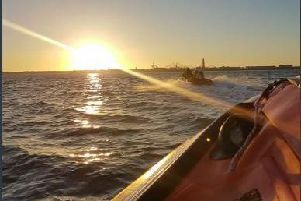 Veteran volunteer lifeboat helmsman Shaun Wright was driving down the Prom on his way to enjoy a family meal when his pager went off 14 years ago today. Leaving his wife to shield their children’s eyes from the horror that was unfolding, he went to the lifeboat station. Although he was not involved in the rescue of Ian and Debbie, he helped to retrieve the jet ski and to take investigators to the Pier. He said: “It’s quite a long time ago now and we have had a lot of rescues since, but what stands out the most it how appreciative Debbie is and how much she does for Blackpool RNLI. Royal National Lifeboat Institution (RNLI) lifeboats in Blackpool launched 84 times in 2016. It means volunteers at the charity, which relies solely on public donations, went out on emergency calls once every four days on average. Behind only Sunderland, which saw 100 launches, Blackpool was home to the second busiest lifeboat station in the North. RNLI lifesaving manager Darren Lewis praised the volunteers, adding: “In 2016, our charity’s lifeboat crews and lifeguards in the north saved 64 lives. For a split second, the buzz of Blackpool Police’s communication centre stopped. All eyes were on CCTV screens around the room. The picture was the same wherever you looked. Two people lying face down in the water. Motionless. It was 3.07pm. Seconds earlier, a message had flashed up on the computer monitors around the room at the Bonny Street depot. Incredibly, given the thousands of tourists packing the Prom on a hot Good Friday, it was the only call the police received about the crash – but it was enough. Seconds later, keyboards all round the room were tapping, voices repeated the details down phone lines and over the radio. Within two minutes, the Coastguard, ambulance, beach patrol, police helicopter, and CCTV suite had all be contacted. Some knew and were already on their way. Just three minutes after the 999 call, emergency workers were on the scene. As the horror unfolded, more details became clear. One jet ski, not two as first reported, was involved. The casualties were one male, one female. The machine had hit steel supports and drifted south, its make and Lake District National Park number, where it was registered, were already known. At first, it was thought that the pair were from Cumbria, but that changed to Manchester, and later Bolton. They were man and wife, it emerged, and police were tasked with the awful job of locating relatives on the beach as they were taken to hospital. At 3.55pm, a message flashed up that nobody wants to see. The man was dead and the woman in a serious condition in hospital. Mark Magee, a holidaymaker from South Shields, said: “I was sitting by the lifeboat station and they were buzzing around the sea. “Then he was shooting across and crashed into the pier. The Gazette’s then assistant editor, Jonathan Lee, went on to write: “Less than an hour since first news of the accident came through, the CCTV pans back onto the Promenade. “It shows children playing, people strolling along in the sunshine, visitors having fun. It’s as if nothing has happened.